Both the Wagner Power Painter Plus 6.6 Gph and the Wagner 0525032 Power Painter Max with EZ Tilt 7.2 Gph are a lot alike with features. The 7.2 is the upgraded model and does have a few extra features to it, but also comes with a higher price tag. What are These Wagner Spray Guns Good for Painting? They both offer the EZ Tilt flexible suction tube so you can spray at any angle. They also both contain the Optimus Dual Tip technology for even coverage, less over spray and more control. In addition, they both have the Sure Prime Suction Valve to eliminate the need for re-priming after a refill. With the easy pour paint can lid, you can get your work done quickly and efficiently. Finally, you can use the material selector option for paint and stains on either model. In exchange, there are several features that each model offers that is unique to the sprayer. This is the lower model of the two and the lower cost option. This is the higher-end model of the two and the higher cost option. 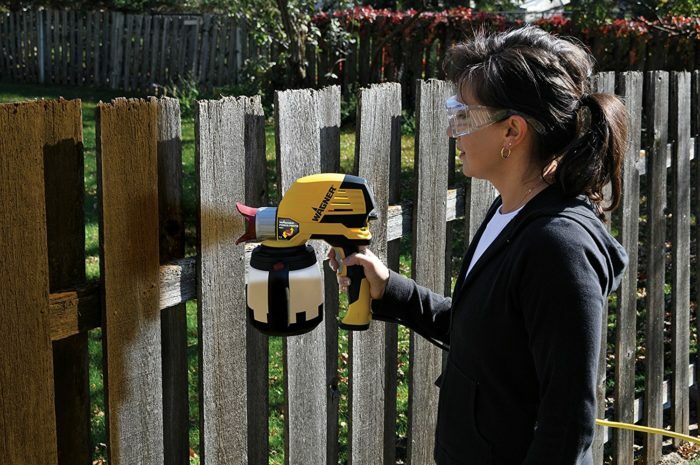 The Wagner Power Painter models offer a fan-shaped spray pattern that is preferred for a multitude of projects. 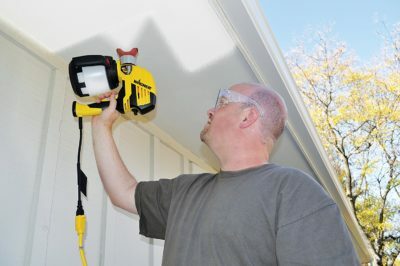 Most homeowners can benefit from these sprayers as well as property managers with just a few houses to care for. The EZ Tilt allows you the chance to spray from any angle: straight down, straight up or as you would with a normal sprayer. Use this for almost any household project including shutters, lattice, sheds, fences, garages and on a smaller-sized house. These sprayers provide full coverage with a consistent finish unlike many of the competitors. Use the Power Painter models whenever you want to cut down your painting time versus using the paint rollers or brushes. Even with the setup and cleanup time, your projects will still be done in a fraction of the time. The electronic controls can be easily adjusted so you achieve the desired painting speed and finish every time. With the quick setup and cleanup, even a beginner can use the Power Painter series of sprayers. Whether you are a beginner or expert, you’ll love the ease and comfortability of the entire Power Painter line from Wagner. The setup of either Wagner Power Painter sprayer takes 5 minutes or less and anyone can do it. Start by removing the cup by pressing and holding the cup release button. Turn the cup to release it and remove. Then, attach the fill lid to the paint container for easy pouring. Do not exceed the max fill line. Put the cup back on and turn to lock. If you are working on a medium or large size job, you’ll want to use the suction tube. Simply twist and remove the suction tube assembly. Then, attach the suction tube housing to the bottom of the sprayer. Rotate the housing in place. You should hear a click. Attach the lid to the paint container and push the hoses through the holes in the lid and down into the bottom of your material container. Always be sure that you take some time practicing your painting on cardboard or scrap material first. This will help you to avoid mistakes on your project. For more detailed setup instructions, always refer to your Owner’s Manual. Both of these Power Painter models feature the Material Select Lever. It is on the rear of the sprayer and allows you to make adjustments based on the material you are spraying. If you are using thicker materials like latex paints, be sure you turn the lever towards the “Paint” option on the sprayer. If you are using thinner materials like stains, be sure the lever is facing “Stains” on the sprayer. In addition, they both offer the adjustable spray tip assembly. This produces a pattern that is adjustable either horizontally or vertically depending on how you will be painting. The Power Painter Max features some additional options. First, the Electronic Speed Control is displayed with two green lights on the right of the control panel. It offers two-speed levels for your paint jobs: lo or hi. The lower the speed, the closer you will be able to get to the work you are doing which will reduce overspray. This gives you greater control but will require more time to cover an area. The Low Cup Level Indicator is available when spraying in cup mode. It is displayed with two red lights on the left of the control panel. When the cup begins to run out of materials, the indicators will blink. That is when you need to stop spraying and refill the container. Empty cups will cause globbing and spitting of materials which could ruin your painting projects. As with most Wagner paint sprayers, you are looking at a fast cleanup with the Power Painter Series. When using the sprayer in cup mode, simply unplug the sprayer and pour the materials back to the original container. Then rinse the inside with the proper solution. Remove your suction tube and filter assembly and disassemble both. Turn the tip nut counterclockwise to remove the adjustable spray tip assembly. Now, you will pull the atomizer valve out and turn the locking nut counter clockwise until it is removed. Slide the pump housing off of your sprayer and remove the spring and piston from the assembly. Clean all of these parts thoroughly with the brush that is provided and your cleaning solution. Before you are done, you need to lubricate the O-rings with some of the included lubricants. If you are cleaning your equipment after using the suction hoses, the direction will be slightly different. Be sure you read through the Owner’s Manual for complete details. No matter what type of paint job you have to do, there is a Wagner Power Painter sprayer perfect for your needs. With its unique set of features, quick setup and fast cleanup, you can have your projects completed in no time.